WARNING: Spoiler alert! Spoiler alert! OK. Are you kidding me? This was just so astounding on so many levels. I mean, first of all Sayid. Shot. Ben. But then to watch him shoot this poor, hurting, abused 12-year-old boy in cold blood. I couldn’t believe it. So, where does that leave us? Has Sayid completed his destiny and changed the course of history by killing Ben? So, no annihilation of the Darma initiative? Has Sayid stopped himself from becoming the killer who worked for Ben after he left the island? Or, could it be that Ben is not really dead? Daniel Faraday said that it isn’t possible to change the past. That leaves me to believe that either the bullet somehow missed Ben’s heart and he isn’t dead. Or that the island’s powers somehow bring back to life people who weren’t supposed to die. In fact, this would then explain WHY Ben became such a heartless, cruel person. Instead of stopping Ben, Sayid might have CREATED the evil Ben that we now know and love. Beyond that, I don’t even know what to say about this week’s episode. We also have the new mystery of who hired the woman who brought Sayid on the plane. His reaction in the airport when he saw Hurley, Kate, Jack and Sun was classic. So, what do YOU think? Is Ben really dead??? 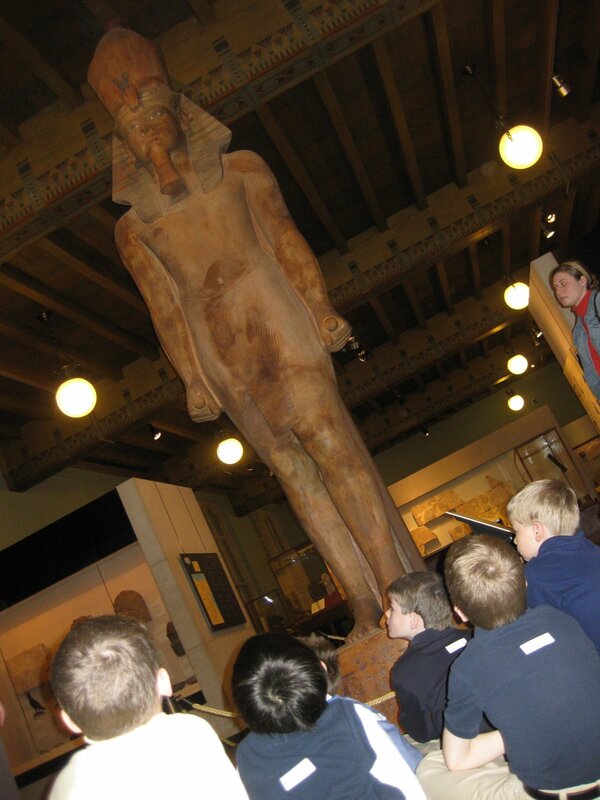 And now, for your entertainment… This week I went on a field trip with my child’s 2nd grade class to the Oriental Institute in Chicago. We saw this monstrous statue of King Tut. Remind you of any four-toed statues in your life?? I also want to offer a theory that I have been thinking about since last week. Remember the episode a few season’s back that was focused on Desmond when his whole life was on a loop and he kept reliving the same part until he found his “constant”? Well, what if that is happening to Ben, Richard and the other Others? Just as Desmond had to give himself clues to find Penny at a certain point in time, maybe they are trying to bring the Oceanic passengers back to a certain point where they can alter events and make the loop stop. Remember how Desmond was “special” and the only one who had been able to alter the course of events to make the loop stop? Well, maybe the same is true of Ben, but he has to get the record to the exact spot and have the right people in place at that moment. This idea is so mind-boggling that it’s really difficult to even think about, but I’ve always wondered why the writers had that whole episode focused on Desmond. It has to be a key to the whole mystery, doesn’t it?? Hey Mrs. Naz, Thanks for coming over. It is quite the convoluted thought process, isn’t it? So you are thinking that the visits of the Oceanic Six to the past weren’t actual events that affected the future, but more like repressed memories? I can see your line of thinking, except for one thing:Charlotte based her whole life on the fact that she had met Daniel Faraday in the past and told her not to return to the island. Or do you think that was DF’s “present” and when we see him later, he was visiting the future? I came over hear via Rocks in My Dryer and wanted to read your recap. I agree that Sayid shooting Ben has some influence on who Ben turned out to be.I’m wondering if the survivors being on the island in the 70s was the catalyst that brought young Ben to eventually become leader of the Others, which is why Ben was so desperate to have the Oceanic 6 back on the island. Which could also be why he found out everything about the plane crash survivors, etc. I just keep thinking back to Richard meeting John Locke in the past and that meeting prompting Richard to see out the young John Locke.Anyway, my head is really spinning!Enjoyed your recap! Ohh you have two really insightful theories!! I think you could definitely be on to something with the first (given the “we can’t change the past” caveat) but I would love it if it were the second… much more redemptive/hopeful. :)I was so excited about your ideas that I edited my review to link to you. 😛 I hope that’s cool! Is is just me, or were you suckered into thinking Horace was going to cut off Sayid’s fingers? Just wondering if I’m alone there. You got me to thinking that Sayid could have created the bad Ben. Can anybody remember if adult Ben had a scar on his chest before now?That would prove your theory. Oh jen, NICE thought about the scar on Ben’s chest. I can’t wait to find out if my theory is correct!